Furukawa Electric has debuted its FITEL S185 series of fusion splicers specifically designed for splicing specialty optical fibres used in optical components, fibre lasers, and optical sensors. The company says that as manufacturers increasingly use specialised fibres for constructing optical components and fibre lasers, conventional fusion splicers are proving unwieldy, expensive, and unsuitable for these applications. By emphasising functions critical to manufacturing and removing extraneous features, Furukawa has created the S185 Fusion Splicer series – a line of more compact, cost-effective, and efficient splicers for use in production and with specialised fibres including Polarisation-Maintaining Fibre (PM Fibre) and Large-Diameter Fibre (LDF). The FITEL S185 Fusion Splicer series currently features three splicers: the S185PM, the S185HS and the S185LDF. While the S185PM and S185HS splicers are designed for use with PM Fibre for optical components, the S185LDF splicer was developed for use with LDF in constructing and maintaining fibre lasers. 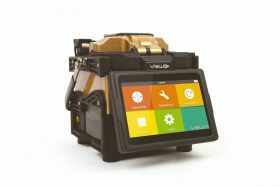 Among the features of the S185 Fusion Splicer series are low splice loss – a new mechanism ensures even greater accuracy in fibre alignment; compact main body/footprint; portability with an optional built-in battery; easy operation by LCD screen with touch panel and clamp soft-landing, which reduces the chance of fibre damage from the canopy). A fourth splicer in the series, the S185PMLDF, is designed for splicing PM-LDF optical fibre and is projected for launch in June 2019. The FITEL S185 Fusion Splicer series is on display at the Photonics West Show in OFS Booth 1559 and 3SAE Technologies, Inc. booth 4985.